Craig Hougen will begin his 20th season coaching the Bemidji State men’s track and field team when organized indoor practices begin next Monday. It could also be his last as the program is scheduled to be cut at the end of the 2008-09 outdoor season under a proposed BSU Department of Athletics reorganization plan announced Wednesday. The primary cause for the proposal is an administrative response to a February 2007 directive from BSU President John Quistgaard to reduce Bemidji State’s direct financial contribution to the Athletic Department by $750,000 over a three-year period. The other cause, Haugen believes, is Title IX considerations. The women’s track and field program and the women’s cross country program are not affected by the proposal. The overall financial directive was part of a $5 million university-wide budgetary restructuring initiative. As part of efforts to come up with the $750,000, there were increases to the student athletic fee, increases in men’s hockey ticket prices which included charges for student tickets and a requirement that all student-athletes be self-insured to compete. The proposal was put forward by Goeb, Quistgaard and Bill Maki, vice president of finance and administration. The proposal will receive input from the Inter-Faculty Organization and a final decision will likely be made before the end of fall semester on Dec. 17. Hougen, who also coaches women’s track and field, cross country and serves as an associate professor, is concerned about the effect on the students should the men’s track and field program be eliminated. Some members of the BSU men’s track and field team were taking part in unofficial practices Wednesday at Gillett Recreation-Fitness Center. Some became aware of the news by reading the Bemidji State Athletics Web page, where the press release detailing the proposal was released Wednesday afternoon. Hougen estimated that about half of the 50-member team were aware of the proposal as of Wednesday night. One of the team members is junior decathlete and heptathlete Zac Preble. Preble was named to the Division II All-Academic Track and Field Team last season, is the two-time defending Northern Sun Intercollegiate Conference decathlon champion and qualified for the Division II national tournament last season. “I’m really at a loss for words, it was pretty stunning to show up to practice today and hear this news,” Preble said. Hougen said that the proposal will mean hard decisions for some of the team members who want to continue competing through graduation. If the program is cut, some will likely transfer to other schools. Preble is a graduate of Greenway High School in Coleraine and planned to attend a technical school to pursue a degree in construction, but chose Bemidji State for the opportunity to compete on the football and track teams. He has developed into a decathlete that Hougen believes has the talent to compete at the Olympic Trials. Hougen’s outlook is not far fetched as BSU’s men’s track and field program has a record of success. Joe Remitz, last year’s NCAA Division II shot put champion, was invited to compete in the shot put at the Olympic Trials last summer. If the proposal goes through, Hougen said the effects will go beyond Bemidji State. The men’s track and field team sponsors several high school track meets throughout the year including the Little Amik I, Little Amik 2, the Lions’ Club meet and the Beaver Relays. The events draw schools from as far as Fargo, Grand Forks, International Falls, St. Cloud and the Twin Cities metro area. Without the volunteer efforts of the men’s track and field team to help administrate, Hougen said it will be difficult for those events to continue without funding from the high schools. “We would come out there and help with the high school meets and we did it without getting paid. We came out not because we had to and I enjoyed it,” Preble said. Bemidji State hosts the NSIC Indoor Championships each February and Hougen said not having that event will affect local businesses. “If we didn’t have that conference meet — we have 14 schools coming in for two days with busloads of around 500 people. That’s a lot of hotel rooms and a big economic impact,” Hougen said. 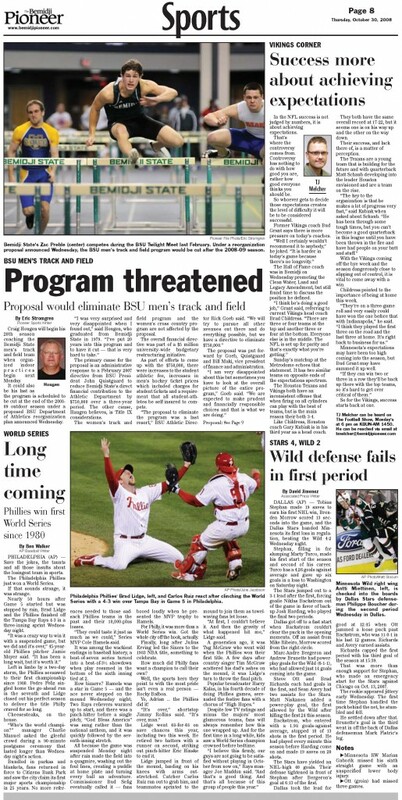 Should the proposal move forward, Bemidji State would be the lone team in the Northern Sun Intercollegiate Conference without a men’s track and field team. Hougen said NSIC Commissioner Butch Raymond is aware of the proposal and the two spoke over the phone Wednesday. Goeb said he was concerned about the possibility of women leaving the program. Goeb said he hopes to “absolutely” increase the offerings for the women’s track and field program and other sports programs at BSU. The NSIC expanded from 10 teams to 14 teams this season and Goeb has a priority to keep Bemidji State competitive in one of the largest Division II conferences in America. Hougen said he has a hard time understanding the financial aspects of the decision. Hougen said he does not plan to sit by and wait for the proposal to become finalized.